What is the FREQUENCY Function? The FREQUENCY Function is categorized under Statistical functionsFunctionsList of the most important Excel functions for financial analysts. This cheat sheet covers 100s of functions that are critical to know as an Excel analyst. The function will calculate and return a frequency distribution. We can use it to get the frequency of values in a dataset. In financial modelingWhat is Financial ModelingFinancial modeling is performed in Excel to forecast a company's financial performance. Overview of what is financial modeling, how & why to build a model. A 3 statement model links income statement, balance sheet, and cash flow statement. More advanced types of financial models are built for valuation, plannnig, and, FREQUENCY can be useful in calculating the frequency of a value within a range of values. For example, we can use the function to count the number of employees whose IQ falls within a certain range. Data_arrays (It is a required argument) – It is an array or reference to a set of values for which you want to count frequencies. Bins_array (It is a required argument) – It is an array of intervals (“bins”) for grouping values. If data_array contains no values, FREQUENCY returns an array of zeros. If bins_array contains no values, FREQUENCY returns the number of elements in data_array. We need to enter numbers that represent the bins we want to group values into. Make a selection the same size as the range that contains bins, or greater by one, if we want to include the extra item. Enter the FREQUENCY function as an array formula using Control+Shift+Enter. 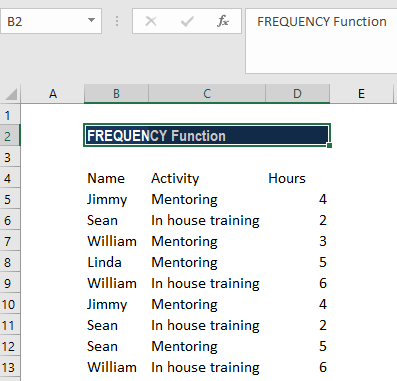 How to use the FREQUENCY Function in Excel? Suppose we are a toy manufacturing company. 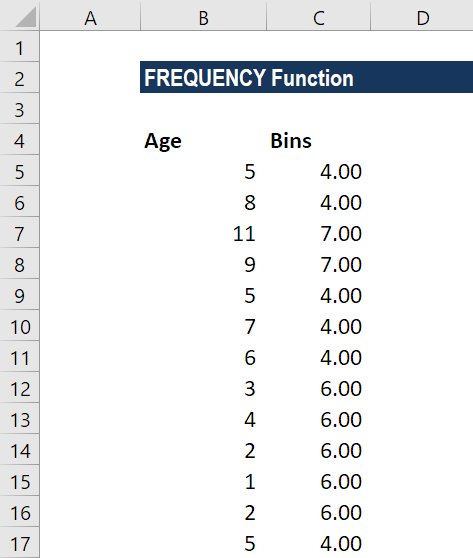 We can use the FREQUENCY function to count the number of children falling into three different age ranges, which are specified by the bins_array (stored in cells B2-B3 of the spreadsheet). 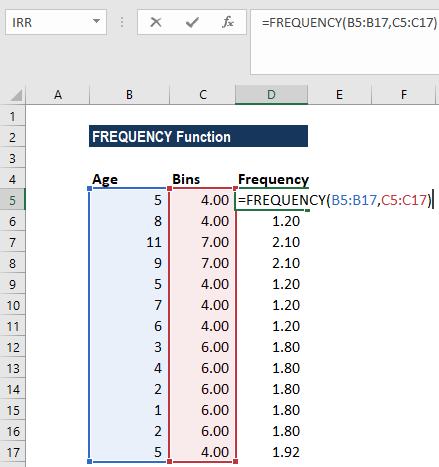 In the table above, the bins_array values specify the maximum values for the age ranges. Therefore, in this example, the ages are to be split into the ranges 0-4 years, 5-8 years and 9 years+. FREQUENCY would be entered as an array formula after we select a range of adjacent cells into which we want the returned distribution to appear. FREQUENCY function will always return an array with one more item than the bins_array. It is done by design to catch any values greater than the largest interval in the bins_array. Each bin shows a count of values up to and including bin value, excluding values already accounted for. 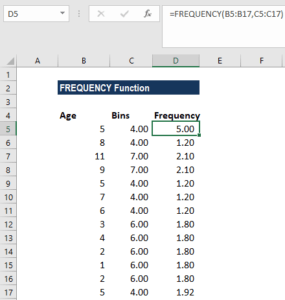 We can use the FREQUENCY function to count unique values in a range with some criteria. Suppose we are given a list of employees who participated in an activity, along with the time expended on the activity. Looking at the data below, we can see that the same employee names appear more than once, so what we want is a count of the unique names. The function ignores blank cells. #N/A error – Occurs if the array formula is entered into a range of cells that is too large, i.e., the #N/A error appears in all cells after the n’th cell (where n is the length of the bins_array + 1).